Research Roundup: Alzheimer’s disease in the wild, second CAR-T therapy approved and more! Traces of Alzheimer’s Disease Detected in Wild Animals for the First Time. Researchers, including Simon Lovestone of Oxford University, have found evidence of Alzheimer’s in dolphins. Dr. Lovestone asked the question, “Are dolphins, as a result of their long lives, susceptible to age-related neurological diseases, such as Alzheimer’s?” To find the answer, he and his colleagues studied the brains of wild dolphins who died naturally. The researchers found two proteins that are referred to as “the smoking guns of Alzheimer’s disease in humans” in these wild dolphins’ brains. It is not known if dolphins experience the same cognitive symptoms. The latter question can only be studied with captive dolphins which is not being advocated for by these researchers. They are hopeful that comparative studies of dolphin and human brains with Alzheimer’s will show what factors are responsible for the disease in order to develop treatments in the future. This study was published in Alzheimer’s and Dementia. Ottawa researchers develop new animal model for a rare, debilitating childhood disease. Pyridoxine-dependent epilepsy (PDE) is a rare disorder that causes infants and young children to suffer from prolonged seizures and related neurological problems which do not respond to commonly used epilepsy medications. Currently, symptoms are managed with large doses of pyridoxine, also known as vitamin B6. A team including researchers from the University of Ottawa and the Children’s Hospital of Eastern Ontario have developed a model for PDE using zebrafish that share the same genetic mutation as affected children. Newly hatched and very young zebrafish show similar epileptic and neurological symptoms which also respond to treatment with vitamin B6. The hope with this new animal model for PDE is for the development of new treatments, and better outcomes for the affected children. This research was published in Genetics. A little myelin goes a long way toward restoring nervous system function. Myelin, the lipid/protein sheath that surrounds and protects nerve fibers, is critical for electrical signaling in the brain and for quickly sending nerve impulses from the brain to the body. Though it is well known that diseases of the nervous system, like multiple sclerosis, degrade myelin, what remains to be discovered is how myelin naturally repairs itself and whether thin myelin sheaths can restore brain circuitry over the long term. Researchers at the University of Wisonsin-Madison, studying a unique but common genetic mutation in Weimaraner dogs and remyelination of the optic nerve in cats, reported this week that renewed but thin myelin sheaths are sufficient to restore the impaired nervous system. Moreover, they can do so years after disease onset. These important findings confirmed that the gold standard for evaluating remyelination is the long-term persistence of myelin sheaths, which support nerve fiber function and survival. Future research will now be able to leverage this knowledge to test new therapies designed to promote myelin repair. The study was reported in the Proceedings of the National Academy of Sciences USA. The normal mature dog spinal cord (A) has many axons surrounded by thick myelin sheaths (blue). 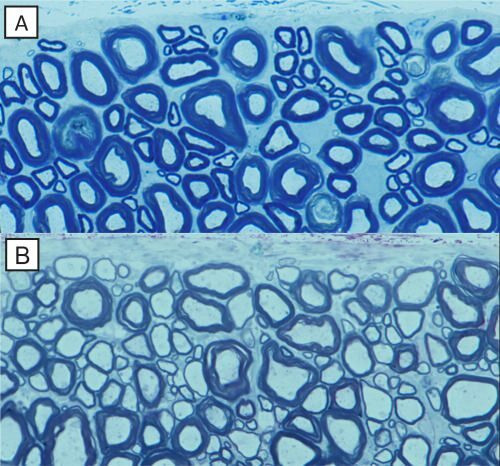 In contrast, in the recovered 13-year-old dog with the genetic abnormality (B), there are many axons with thin myelin sheaths, identical to that seen in remyelination. Source. FDA Approves Second CAR T-Cell Therapy. CAR T is a pioneering type of gene therapy for cancer. CAR T-cells are equivalent to given patients a “living drug”. “The therapy requires drawing blood from patients and separating out the T cells. Next, using a disarmed virus, the T cells are genetically engineered to produce receptors on their surface called chimeric antigen receptors, or CARs.” While this form of therapy has been in use in various small scale human trials, it is the second approval in the world for a type of CAR T therapy. Much of its success is due to pre-clinical safety and efficacy testing in animals models, such as mice — which we have covered previously. The “living drug”, known as Yescarta is produced by Kite Pharma and owned by Gilead Sciences and is approved for use against some types of large B-cell lymphomas. It costs 373,000 USD for the life-saving treatment. Secrets to how rabies causes aggressive behavior untangled. Rabies is a viral disease which leads to encephalitis (inflammation of the brain) in mammals. While much is known about rabies, including our ability to vaccinate against it, a lot is unknown about how the rabies virus “hijacks” the brain and leads to aggressive behaviour. These researchers, using mice, investigated whether the rabies glycoprotein, which accumulates in the brain after virus exposure leads to behavioral changes. Dr. Harris, the lead researcher of this study stated, “When we injected this small piece of the virus glycoprotein into the brain of mice, the mice started running around much more than mice that got a control injection. Such a behavior can be seen in rabies-infected animals as well.” This research was published in the journal Scientific Reports. Posted on October 27, 2017 by EditorPosted in News, Research RoundupTagged alzheimer's disease, CAR T, mylein, Pyridoxine-dependent epilepsy, rabies.